Diffraction gratings are fascinating. The iridescent reflections from the grooves of a compact disc (CD), or from oil films, soap bubbles: it is all the same principle (or closely related – to be precise). In my April, 2014 posts, I introduced Feynman’s ‘arrows’ to explain it. Those posts talked about probability amplitudes, light as a bundle of photons, quantum electrodynamics. They were not wrong. In fact, the quantum-electrodynamical explanation is actually the only one that’s 100% correct (as far as we ‘know’, of course). But it is also more complicated than the classical explanation, which just explains light as waves. To understand the classical explanation, one first needs to understand how electromagnetic waves interfere. That’s easy, you’ll say. It’s all about adding waves, isn’t it? And we have done that before, haven’t we? Yes. We’ve done it for sinusoidal waves. We also noted that, from a math point of view, the easiest way to go about it was to use vectors or complex numbers, and equate the real parts of the complex numbers with the actual physical quantities, i.e. the electric field in this case. You’re right. Let’s continue to work with sinusoidal waves, but instead of having just two waves, we’ll consider a whole array of sources, because that’s what we’ll need to analyze when analyzing a diffraction grating. Let’s first re-analyze the simple situation: two sources – or two dipole radiators as I called them in my previous post. 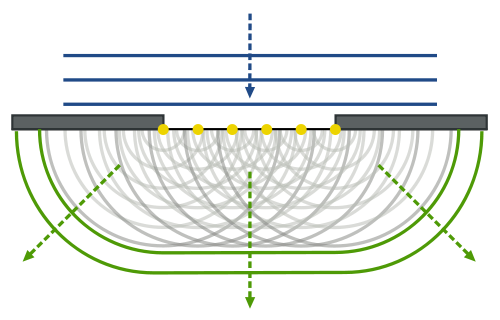 The illustration below gives a top view of two such oscillators. They are separated, in the north-south direction, by a distance d.
For light, it will work differently – and we’ll describe how, but not now. As for now, we should continue with our radio waves. That’s pretty obvious, but let’s play a bit with this, in order to make we understand what’s going on. The illustration below gives two examples: α = 0 and α = π. The last term in this sum is the interference effect, and so that’s equal to zero in the case we’ve been studying above (α = 0, d = λ/2 and θ = 30°), so we get twice the intensity of one oscillator only. The other cases can be worked out in the same way. Now, you should not think that the pattern is always symmetric, or simple, as the two illustrations below make clear. Let’s look at that now indeed: arrays with n oscillators. Now, we have an interesting geometrical approach to finding the net amplitude AR. We can, once again, consider the various waves as vectors and add them, as shown below. This formula is obvious for n = 1 and for n = 2: it gives us the results which were shown above already. But here we want to know how this thing behaves for large n. It is easy to see that the numerator above, i.e. sin2(nΦ/2), will always be larger than the denominator, sin2(Φ/2), and that both are – obviously – smaller or equal to 1. It can be demonstrated that this function of the angle Φ reaches its maximum value for Φ = 0. Indeed, taking the limit gives us I = I0n2. [We can intuitively see this because, if we express the angle in radians, we can substitute sin(Φ/2) and sin(nΦ/2) for Φ/2 and nΦ/2, and then we can eliminate the (Φ/2)2 factor to get n2. It’s a bit more difficult to understand what happens next. If Φ becomes a bit larger, the ratio of the two sines begins to fall off (so it becomes smaller than n2). Note that the numerator, i.e. sin2(nΦ/2), will be equal to one if nΦ/2 = π/2, i.e. if Φ = π/n, and the ratio sin2(nΦ/2)/sin2(Φ/2) then becomes sin2(π/2)/sin2(π/2n) = 1/sin2(π/2n). Again, if we assume that n is (very) large, we can approximate and write that this ratio is more or less equal to 1/(π2/4n2) = 4n2/π2. That means that the intensity there will be 4/ π2 times the intensity of the beam at the maximum, i.e. 40.53% of it. That’s the point at nΦ/2π = 0.5 on the graph below. So, once we’re past that 40.53% point, we get at our first minimum, which is reached at nΦ/2π = 1 or Φ = 2π/n. The numerator sin2(nΦ/2) equals sin2(π) = 0 there indeed, so the whole ratio becomes zero. Then it goes up again, to our second maximum, which we get when our numerator comes close to one again, i.e. when sin2(nΦ/2) ≈ 1. That happens when nΦ/2 = 3π/2, or Φ = 3π/n. Again, when n is (very) large, Φ will be very small, and so we can substitute the denominator sin2(Φ/2) for Φ2/4. We then get a ratio equal to 1/(9π2/4), or an intensity equal to 4n2I0/9π2, i.e. only 4.5% of the intensity at the (first) maximum. So that’s tiny. [Well… All is relative, of course. :-)] We can go on and on like that but that’s not the point here: the point is that we have a very sharp central maximum with very weak subsidiary maxima on the sides. To focus our minds, we’ve depicted that array with n oscillators below. Once again, we note that the phase difference between two sources, one to the next, will depend on (1) the intrinsic phase difference between them, which we denote by α, and (2) the time delay because we’re observing the system in a given direction q from the normal, which effect we calculated as equal to (2π/λ)·d·sinθ. So the whole effect is Φ = α + (2π/λ)·d·sinθ = a + k·d·sinθ, with k the wave number. To make things simple, let’s first assume that α = 0. We’re then in the case that we described above: we’ll have a sharp maximum at Φ = 0, so that means θ = 0. It’s easy to see why: all oscillators are in phase and so we have maximum positive (or constructive) interference. Let’s now examine the first minimum. When looking back at that geometrical interpretation, with the polygon, all the arrows come back to the starting point: we’ve completed a full circle. Indeed, n times Φ gives nΦ = n·2π/n = 2π. So what’s going on here? Well… If we put that value in our formula Φ = α + (2π/λ)·d·sinθ, we get 2π/n = 0 + (2π/λ)·d·sinθ or, getting rid of the 2π factor, n·d·sinθ = λ. Now, n·d is the total length of the array, i.e. L, and, from the illustration above, we see that n·d·sinλ = L·sinθ = Δ. So we have that n·d·sinθ = λ = Δ. Hence, Δ is equal to one wavelength.That means that the total phase difference between the first and the last oscillator is equal to 2π, and the contributions of all the oscillators in-between are uniformly distributed in phase between 0° and 360°. The net result is a vector AR with amplitude AR = 0 and, hence, the intensity is zero as well. OK, you’ll say, you’re just repeating yourself here. What about the other lobe or lobes? Well… Let’s go back to that maximum. We had it at Φ = 0, but we will also have it at Φ = 2π, and at Φ = 4π, and at Φ = 6π etcetera, etcetera. We’ll have such sharp maximum – the maximum, in fact – at any Φ = m⋅2π, where m is any integer. Now, plugging that into the Φ = α + (2π/λ)·d·sinθ formula (again, assuming that α = 0), we get m⋅2π = (2π/λ)·d·sinθ or d·sinθ = mλ. While that looks very similar to our n·d·sinθ = λ = Δ condition for the (first) minimum, we’re not looking at that Δ but at that δ angle measured from the individual sources, and so we have δ = Δ/n = mλ. What’s being said here, is that each successive source is out of phase by 360° and, because, being out of phase by 360° obviously means that you’re in phase once again, ensure that all sources are, once again, contributing in phase and produce a maximum that is just as good as the one we had for m = 0. Now, these maxima will also have a (first) minimum described by that other formula above, and so that’s how we get that pattern of lobes with weak ‘side lobes’. The point to note is that we can only have subsidiary great maxima if the spacing d of the array is greater than the wavelength λ. If we have such subsidiary great maxima, we’ll call them first-order, second-order etcetera beams, according to the value m.
We are now, finally, ready to discuss diffraction gratings. A diffraction grating, in its simplest form, is a plane glass sheet with scratches on it: several hundred grooves, or several thousand even, to the millimeter. That is because the spacing has to be of the same order of magnitude of the wavelength of light, so that’s 400 to 700 nanometer (nm) indeed – with the 400-500 nm range corresponding to violet-blue light, and the (longer) 700+ nm range corresponding to red light. Remember, a nanometer is a billionth of a meter (1´10-9 m), so even one thousandth of a millimeter is 1000 nanometer, i.e. longer than the wavelength of red light. Of course, from what we wrote above, it is obvious that the spacing d must be wider than the wavelength of interest to cause second- and third-order beams and, therefore, diffraction but, still, the order of magnitude must be the same to produce anything of interest. Isn’t it amazing that scientists were able to produce such diffraction experiments around the turn of the 18th century already? One of the earliest apparatuses, made in 1785, by the first director of the United States Mint, used hair strung between two finely threaded screws. In any case, let’s go back to the physics of it. When Feynman says “light” here, he means electromagnetic radiation in general. But so what’s happening with visible light? Well… All of the glass in that piece that makes up our diffraction grating scatters light, but so the notches in it scatter differently than the rest of the glass. 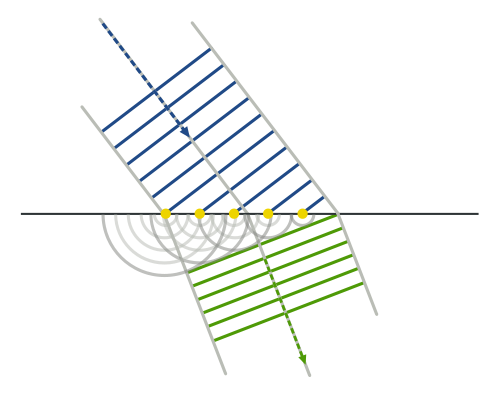 The light going through the ‘rest of the glass’ goes straight through (a phenomenon which should be explained in itself, but so we don’t do that here), but the notches act as sources and produce secondary or even tertiary beams, as illustrated by the picture below, which shows a flash of light seen through such grating, showing three diffracted orders: the order m = 0 corresponds to a direct transmission of light through the grating, while the first-order beams (m = +1 and m = -1), show colors with increasing wavelengths (from violet-blue to red), being diffracted at increasing angles. This comes from Wikipedia, as do the illustrations below. It does not only ‘explain’ diffraction gratings, but it also ‘explains’ what happens when light goes through a slit, cf. the second (animated) illustration. Now that, light being diffracted as it is going through a slit, is obviously much more mysterious than a diffraction grating – and, you’ll admit, a diffraction grating is already mysterious enough, because it’s rather strange that only certain points in the grating (i.e. the notches) would act as sources, isn’t it? Now, if that’s difficult to understand, it’s even more difficult to understand why an empty space, i.e. a slit, would act as a diffraction grating! However, because this post has become way too long already, we’ll leave this discussion for later. This entry was posted in Physics and tagged classical theory of electromagnetic radiation, diffraction gratings, Huygens-Fresnel. Bookmark the permalink.